I have known Britta Quade-Cherek for more than five years now. We recently saw each other again at a conference in Wolfsburg where Johann Jungwirth, CDO of the Volkswagen Group, gave the keynote about VW’s view on Digital Transformation. During a networking break, Ms. Quade-Cherek and I discussed Digital Transformation and its effect on corporate culture. 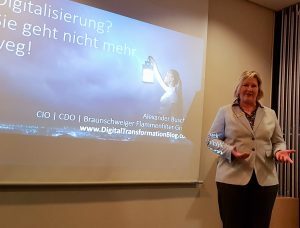 She invited me to speak in a few weeks at the ZONTA Club of Hannover about my personal view on Digital Transformation. I happily agreed! These ladies work vigorously to affect society’s treatment of women worldwide, which is something that is very important. Despite this, I thought they might not be as technologically savvy an audience as I am used to. With this in mind, I made sure to prepare a bit differently. My wife and I arrived at the meeting in Hannover, and ZONTA members greeted us warmly. I titled my presentation, “Digitalization? It won’t go away! ” Looking back, the title couldn’t have been any better. Digitalization started many years ago—catch up now! My presentation (click here to download the German PDF) started with the general idea that digitalization is not a new concept. The first mainframe computers were used in different industries over 50 years ago, and the IBM PC was introduced shortly thereafter. Even so, many current SMBs suffer from too much paper circulating the organization . When it comes to digitalization, catching up is the first challenge for any business. To catch up, get rid of the paper in your organization and make sure the ERP system is primary and includes all necessary data. Get rid of Excel sheets as well! They provide a different truth than the ERP system. I call this a catch-up-process. At this point, I presented various new technologies that have matured in recent years. Of course, it is not only big enterprise that is affected by these technologies. One example is how 3D printing is starting to disrupt the field of dental technology. Disruption was the next topic I covered. I showed the Kodak example (see my article Why Digital Optimization And Industry 4.0 Is Not Enough!). Kodak underestimated their new product—the digital camera—and highly overestimated the potential of their existing business model—celluloid film. This has happened with other companies. For example Blockbuster, who should have been trailblazers in their industry (think Netflix ), but did not read the signs and eventually faced bankruptcy. Nokia, of course, is another famous example. Technology was certainly interesting for this audience. Disruption started to attract attention, but the topic of New Work, corporate culture, and digital leadership grabbed everyone’s attention. Four years ago, every 5th employee came from Generation Y. Two years from now, half of the workforce will be Generation Y or Z. These generations have a different approach to work and the tools they expect to use. It is very important to understand their expectations because, whether we like it or not, this will disrupt both the way we work and our corporate culture. 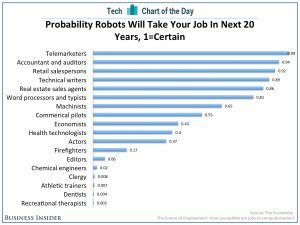 Next, I showed a disturbing graph illustrating which jobs would likely be taken over by robots or computers (AI) within the next 20 years. What does digitalization do to employees? Can we zone out if the smartphone is omnipresent? What about those who are poorly educated? How does society deal with this? We asked, “How can we solve the problem?” The general belief was that digitalization is unhealthy. At that point, the title of the speech made perfect sense. Whatever the solution may look like, the answer will never be to stop digitalization. The only solution can be to change the way we interact with new technology in order to get the best results for the entire society. The audience resembled society very well: doctors, business ladies, psychologists, dental technicians, etc.